Your customers may not consciously be aware, but visual merchandising – the design of window displays, store layouts, signage and shelving – can play a large part in their decision to commit to a sale. Find out how variations in our shopping environment can affect our psychology and get tips on how to create visual displays that encourage sales. Buying online from a two-dimensional screen is a convenient choice for most people, but nothing can beat the sensory experience of window shopping. Many online sales are actually prompted by a physical visit to a store, where customers value the chance to interact with a brand, try on clothes and ask questions in a real-life environment. That’s largely down to the impact of visual merchandising: the practice of creating a pleasing, on-brand retail experience that promotes your brand values, draws attention to your products and helps customers feel that all their needs are taken care of. For most stores with a physical presence on the street, the window display is crucial. Your shop window tells the world who you are, communicating your brand values and (hopefully) influencing passers-by to stop and step inside. 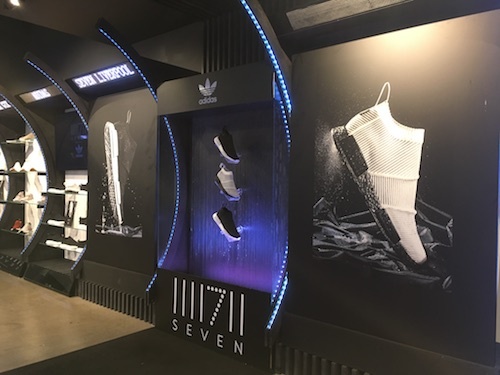 Far more than just a space to display your latest wares, the visual merchandising display at the front of your store is a calling-card for your brand. Create a showstopper. Nothing has the same power to attract impulsive buyers, so pull out all the stops to create a compelling visual display in your window. Keep it fresh, or your store will start to blend into the background. Update your display at least every two months, to create excitement and anticipation. The way that we walk through a store, and what we see on the way around, influences what we buy. The science of store layout is based on studies of consumer behaviour, so the most effective retailers will try to anticipate their customers’ needs and design their layout accordingly. Welcome them in. The ‘decompression zone’ is the area of the shop your customers enter when they walk through your doors. It’s a crucial aspect of visual merchandising for retail; get it wrong and they may walk straight out again. Allow some space here and don’t crowd it with products; instead, make sure your store interior looks welcoming, with lots of tempting areas to explore. In-store promotions can have a big impact on sales. These are carefully selected displays that showcase a particular product and encourage customers to buy it. Lighting, signage, money-off deals and creative imagery can all have an influence here. Point of sale visual merchandising displays encourage opportunistic, impulse buys. They represent a customer’s last chance to select a product before paying for their goods. Small items that complement existing purchases are always successful sellers: things like batteries, tights and accessories are sensible choices. Visual merchandising is one of the most effective ways to promote your products and showcase your wares. For ideas on how to display your products, check out some of our retail projects involving shop window displays and in-store promotions.